This package includes both the workshop and feedback components as well as access to the Leaders Network Hub to help you every step of the way. Detailed videos to help you set up and run Scores on the Board with your team. Management and coaching tools to develop your teams performance. Ask the Scores on the Board team any question to help with your development. Track your teams progress and action plans with your wall Scoreboard. A comprehensive team implementation workshop (4hrs) to get you up and running. Online feedback and performance reports for team and customers over a 12 month period. Everything you need to set up and run the system. Ask any question you need to help further develop yourself and your team. Standard – we will post your Scoreboard to you. Standard + Feedback – we will contact you to arrange our feedback set up process. Full Package – we will contact you to arrange your implementation workshop and feedback set up process. 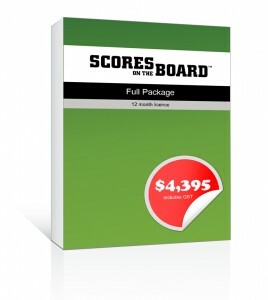 After purchasing your Scores on the Board package you will receive an email with access details to the online information. Access to the website is for 12 months. You can renew your access at any time. If you pay via the Credit Card option your bank statement charge will show as being from Institute of Advanced Business Studies. Payment is a once off payment.